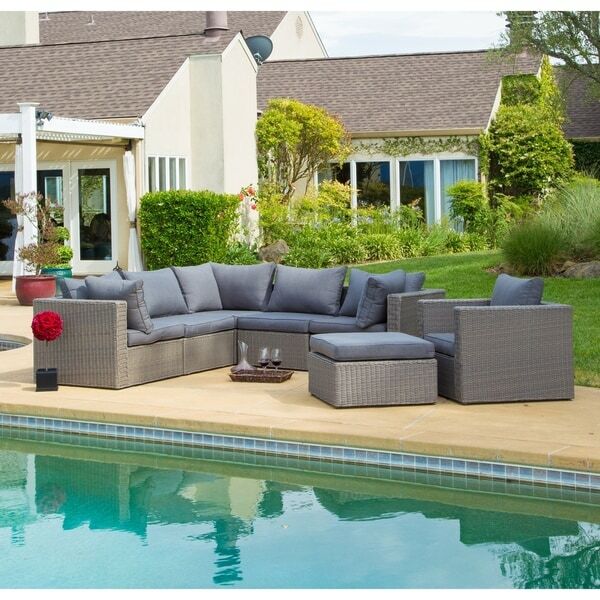 Let Sevilla 7-piece grey wicker sofa set by Corvus bring comfort and design to your patio, garden or yard. Featuring durable powder coated aluminum frame, this set is crafted from all-weather hand woven resin wicker. The amply padded cushions offer great comfort for you and your guest to sit back and relax. You can arrange the pieces in diverse ways for gatherings and parties. We love this set, the color is more gray than blue but it's perfect for what we were looking for. I searched a ton before deciding on this piece and I am so happy with my purchase. We have received so many compliments on how comfortable it is. Great purchase! Very pretty. Good value for the money. I love how this set looks. It's very pretty. It's definitely not a true grey, but rather a brownish grey, but a very rich tone. The cushions are thick, but a bit stiff, so if you're looking for something you can just sink into, this isn't it. It's not flame resistant, so if you're planning on using this near a fire pit, I'd choose a different set. Other drawbacks, it doesn't have a way to connect the pieces, so everything shifts around when you sit on it. Makes it look messier than I like and probably what I like least about this. I also wish there was a way to purchase additional pieces to add more seating, like another club chair or two, so that it all matches. But overall I'm pleased with the purchase for the price. Let's see how it holds up in the Arizona heat. Great product! Comfortable cushioning and sturdy frames. We love this patio set! Patio furniture is very expensive but yet again Overstock came thu with a great patio set at excellent value. 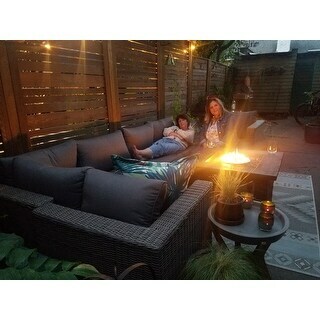 It is well made and the cushions are fat and very comfy. We haven't tried washing them yet but I love that they are washable. The dark color doesn't show dirt which is a plus when you have two little kids. We did have one issue in that the clips to attach the chairs were defective - only one of the four sets worked. However, the manufacturer was very responsive when I reached out for a new set and they sent them to me right away. We haven't had a chance to test them yet but if they don't end up working I'm confident they will help us find another solution. We love this set. The seats are more grey than in the picture. It came with the clips to attach all the pieces together. I will be bringing the cushions and pillows in during the winter as recommended. This set it beautiful! It really looks great on our patio. It is very comfortable. It came in 4 big boxes all about 60 lbs each. There was no assembly required. I would highly recommend this set! I love this set! It is exactly what I wanted and the price was amazing! The fabric on the cushions is great and seems very durable so far...we have 4 dogs so we need durability. And all of the cushions zip off and can be washed. Clipping the seats together was challenging and they don’t stay clipped, but that’s a small concern based on the price and quality! Exactly as pictured, no assembly required! Best value for the price/style. No problems with shipping and arrived well before expected. Gray wicker with blue/gray cushions. Cushions very well padded, easy to configure and rearrange to your space. A great addition to our deck. We love our outdoor furniture set. The quality is top notch! We put it out by our pool in a screened in porch and it's great there! Shipping and service was also perfect. Thanks Overstock! Awesome set! Had some AMAZING parties on this wicker furniture. 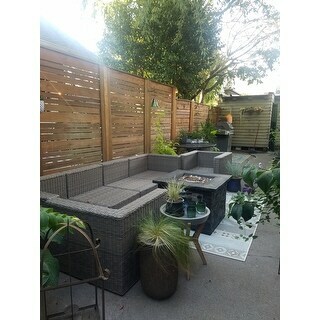 Many MANY people were complimenting my wife and I and saying how jealous they were, and wished they had something similar for their backyard decks! I told them where to go buy them!!! 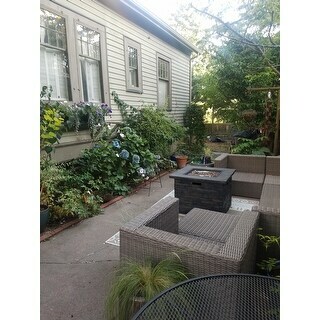 Have made my outdoor area my happy space. Cushions are a light charcoal grey, not blue, wicker is neutral color. Very comfortable. Spent most of the afternoon and evening out there reading and gabbing. With a glass of wine...or two. Everyone has loved hanging out there! Despite the fact that this INCLUDES white glove delivery service as stated on the website Overstock refuses to honor this and it's a major hassle to get the delivery team to remove the giant boxes. I wish I could post a pic of this from my phone, but the Overstock app won’t let me. However, this is more of a dark grey look in person. I absolutely love it, it’s perfect for my back patio/porch. I sprayed it with Scotchguard to protect from the elements. Great value for the $$. This set is just as described except the cushions are solid grey not a blueish grey. The kids think it’s great for fort building and I’m satisfied with the comfort. It’s not the most comfy couch ever but not bad for wicker. Everything came packaged well and clean. "Can the sectional appear to be more rounded?Hard to tell from the picture. Also, how weatherproof are the seats? If they get rained on, will it be days before they can be sit on?" Yes, you could round them up, the picture just show the line-up option. This is not very waterproof at all, if they are rained on it may take up to 3 days to dry completely. "Once the pieces are all assembled, what are the total dimensions for the sectional? Length and width?" The assembled dimensions measure approximately 95.1 inches long x 95.1 inches wide. "What are the dimensions of both a seat cushion and a back cushion?" "Are you able to purchase another ottoman separately?" Unfortunately, the ottomans are only currently available in sets. "Does the manufacturer make covers for this set?" Unfortunately at the moment there is no cover specifically designed for this set. It looks really nice and reviews are mostly favorable! "Are the cushions water resistant? Or should they be covered if it rains?" 24" x 24" Waterproof Sunbrella Memory Foam Seat Cushion - 24"x24"